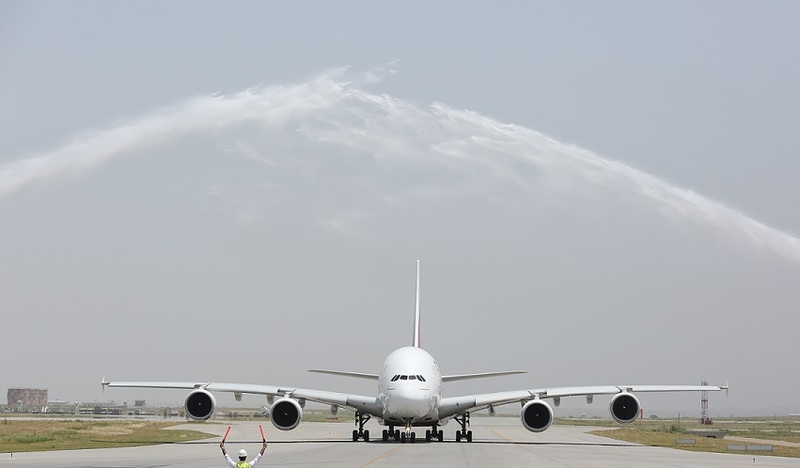 The Emirates A380 touched down in Islamabad today for a historic one-off service to Islamabad International Airport. This was the first time ever that the iconic double-decker aircraft has landed in Pakistan. The special Emirates A380 flight was operated by UAE national, Capt Abbas Shaban, Chief Pilot of Technical Operations and Pakistani national, First Officer Qadir Moin. The landing demonstrated the airport’s readiness to accommodate the A380, the world’s largest commercial passenger jet. Upon landing at 1210hrs at Islamabad International Airport, the aircraft was met with a ceremonial water cannon salute, and the Emirates delegation was welcomed by government officials and Islamabad International Airport executives. After a welcoming ceremony, government officials, VIPs, media and members of the travel industry were given a guided tour of the A380 by Emirates cabin crew. The special flight, operating as EK 2524, was joined by a VIP delegation led by Sheikh Majid Al Mualla, Emirates’ Divisional Senior Vice President, Commercial Operations, Centre and Adil Al Ghaith, Emirates' Senior Vice President, Commercial Operations, GMEI (Gulf, Middle East and Iran). They were joined by His Excellency Hamad Obaid Ibrahim Salem Al Zaabi, the UAE Ambassador to Pakistan and His Excellency Moazzam Ahmad Khan, Pakistan Ambassador to the UAE. Also travelling on the flight as special guests were two Pakistani members of Emirates’ first ever team, Captain Fazle Ghani, the airline’s first Chief Pilot and Team Lead for Inaugural Operations and Captain Ejaz ul Haq, one of the pilots who operated the first ever Emirates flights from Dubai 33 years ago. At special flight of Emirates A380,A VIP delegation led by Sheikh Majid Al Mualla, Emirates’ Divisional Senior Vice President, Commercial Operations, Centre was present . They were joined by Adil Al Gaith - SVP Commericial Operations GMEI, His Excellency Hamad Obaid Ibrahim Salem Al Zaabi, the UAE Ambassador to Pakistan, His Excellency Moazzam Ahmad Khan, Pakistan Ambassador to the UAE . Also travelling on the flight as special guests were two Pakistani members of Emirates’ first ever team, Captain Fazle Ghani, the airline’s first Chief Pilot and Team Lead for Inaugural Operations and Captain Ejaz ul Haq, one of the pilots who operated the first ever Emirates flights from Dubai 33 years ago.They were all welcomed by Jabr Al-Azeeby, Emirates Vice-President Pakistan. Emirates and Pakistan have a long-standing relationship that spans over 30 years, when the airline’s first flight flew from Dubai to Karachi on 25 October 1985. 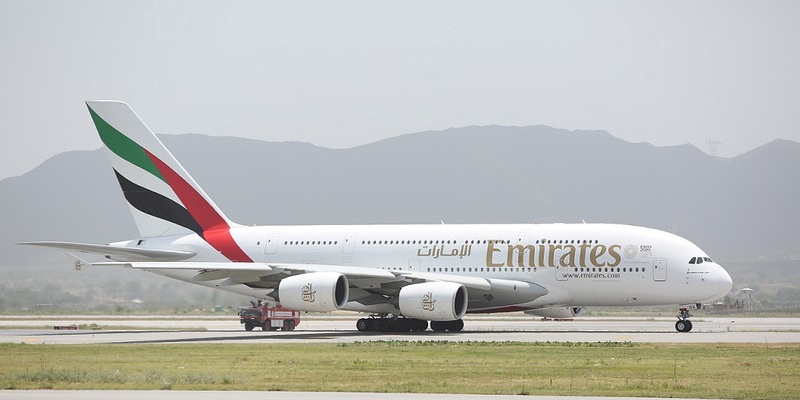 Since then, Emirates has grown exponentially in Pakistan, and today the airline operates 71 weekly flights between Dubai and six cities in Pakistan: Karachi, Lahore, Islamabad, Peshawar, Sialkot and Multan, offering Pakistani travellers convenient access to over 150 global destinations. Emirates also employs over 5,000 Pakistani nationals as Flight Deck crew, Cabin Crew and in various others positions across the airline. Hundreds of passengers travelled on the special flight, many of whom had made their bookings specially for this unique flight. The passengers on board began their journeys from 25 countries reflecting Emirates’ global mix of customers who will benefit from this route.